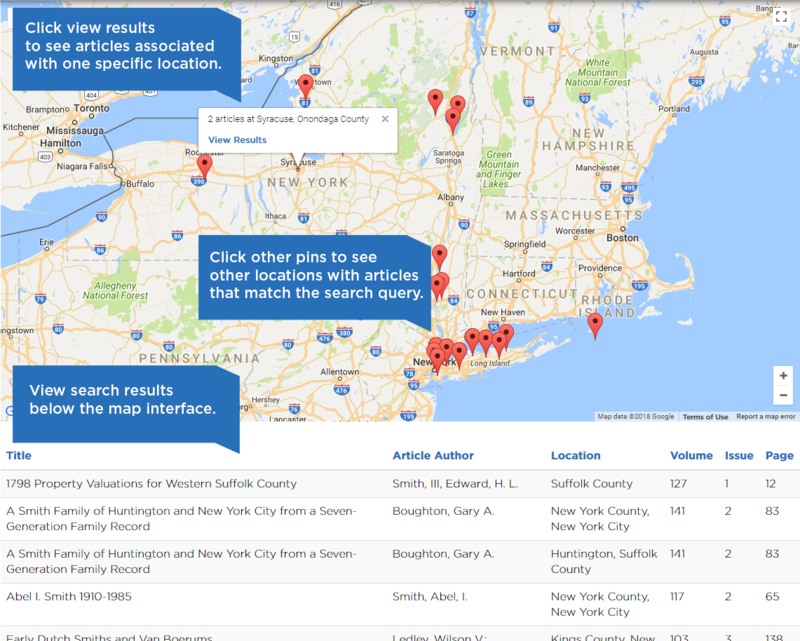 The Record Map Search allows you to search an index of articles from The Record - the quarterly journal of the New York Genealogical and Biographical Society, which has been published continuously since 1870 - and view results organized on an interactive map interface, so you can find articles about a New York State location easily. We welcome you to try a beta version of this tool, which is the product of a collaborative project by an NYG&B Labs team, "Mapping The Record." You can visit labs.newyorkfamilyhistory.org to explore this map-based search engine – please continue reading for a detailed description of the tool, and information about how to use it. This product is still in beta - a beta version of an application or website is one that is complete, but still may have minor bugs or flaws in it, or could benefit from other tweaks and improvements. Please feel free to submit your feedback or any issues you encounter at the bottom of this page. We would like to thank everyone who has supported this project in any way – we couldn’t have done it without your assistance, financial support, and advice. To support the continued improvement of this project, or future NYG&B Labs projects, make a donation today. The Record is an invaluable source for anyone researching New York families, and the archives of The Record are digitized and fully searchable for NYG&B members in our eLibrary. Numerous complete indexes to The Record exist, and are free and open to the public - indexes allow anyone to review and search Record articles by name, article title, subject, and author. If you have never explored the useful articles in The Record, now is the perfect time to start. This online search tool allows you to search our new location-based index. Each article in The Record has been assigned a relevant location or locations - locations have been determined by article title, and/or the location of vital events related to the main individual or family covered in the article. ​This tool allows you to search a database of all articles in The Record (we currently have all articles from 1970 – 2018 in the database as sample data). A group of pins will appear on the map. A row of search results will appear below the map. The search results represent every Record article that matched your search query. The pins on the map show all of the locations associated with the Record articles in the rows below. You can click on an individual pin to see the location name, and how many articles matched the search query for that location. Click the link in the pop-up bubble to filter the rows below to show only Record articles from that location. 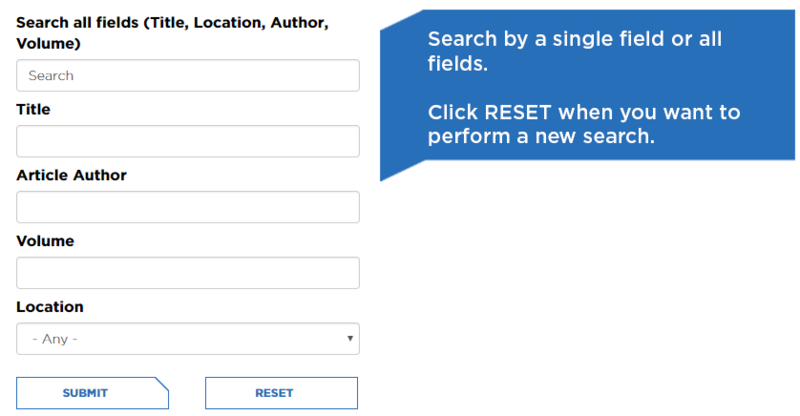 To run another search, you must hit the “reset” button and wait for the pins to clear before searching again. You can also browse all locations and easily view all articles tagged with a particular location from the drop-down menu. Note: If an article's location was outside of New York State, it was classified as "Out of State" - we may someday categorize these articles, but chose to focus on New York State only for our initial project. An NYG&B Labs team member, Kerstin Carson, has been working on indexing every article in The Record and assigning between 1 and 4 locations to each article. If you're interested in learning more, feel free to read Kerstin's blog about this NYG&B Labs project. If an article pertains to an entire county, or if there are many municipalities of the same county in an article, then the article is simply tagged with the county name (e.g. “Rockland County”). The location(s) included in the title of the article. The location(s) of vital events of the subject individual/family of the article. Articles with no locations that fit these two criteria were read by Kerstin and assigned any locations deemed relevant or central to the main content of the article. Please let us know what you think of this beta test project! If you think anything can be improved, or if you experience a bug, please let us know - your feedback will help us improve the project!